DEAD END SKY Releases New Single & Lyric Video For "When You Fall"
Announce Headline Show in Los Angeles For May 16th! Los Angeles, CA modern hard rockers DEAD END SKY aren’t new to the hard rock scene, noting connections to bands like FIVE FINGER DEATH PUNCH, DEVOLVED and DEADSETT. If you are just learning about them, now is the perfect time for you to check out the band’s new single/lyric video for the track "When You Fall" below. The band’s first single, "Always" can also be viewed right HERE. 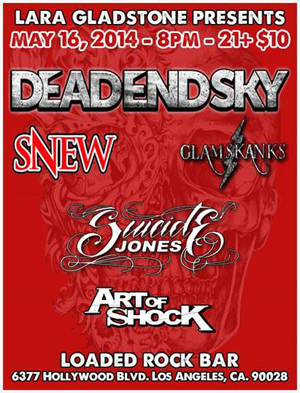 You can also catch DEAD END SKY live as they headline Loaded (21+) this Friday, May 16th, with support from SNEW, GLAMSKANKS, SUICIDE JONES and ART OF SHOCK. The show begins at 8:00PM and is $10. Loaded is located at 6377 Hollywood Blvd., Los Angeles, CA. For more information on the show, please visit www.loadedhollywood.com. Zemanek’s history includes a short stint as original vocalist for metal juggernauts FIVE FINGER DEATH PUNCH. He also was vocalist/songwriter for DEADSETT, a band which featured in its ranks, Chris Howorth (IN THIS MOMENT), Matt Snell (ex-FIVE FINGER DEATH PUNCH), Jeff Fabb (FILTER, ex-IN THIS MOMENT, JAMES DURBIN), and Travis Johnson (IN THIS MOMENT). Joining Zemanek in the group are Rich Abronson (lead guitar), Dan Bartlett (bass) and Masa Oishi (drums). DEAD END SKY recorded at the world famous NRG recording studio in North Hollywood with veteran engineer Josh Newell (LINKIN PARK, AVRIL LAVIGNE, INTRONAUT). 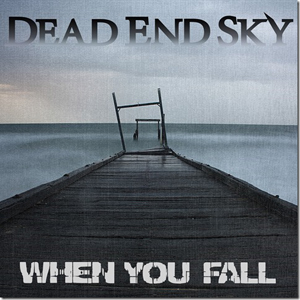 DEAD END SKY's self-titled debut album was mixed by acclaimed producer/mixer Brian Virtue (30 SECONDS TO MARS, CHEVELLE, PUDDLE OF MUDD, JANE'S ADDICTION, ALL THAT REMAINS, SHADOWS FALL). It was mastered by Paul Logus (STONE SOUR, ANTHRAX, VOLBEAT, HELLYEAH).